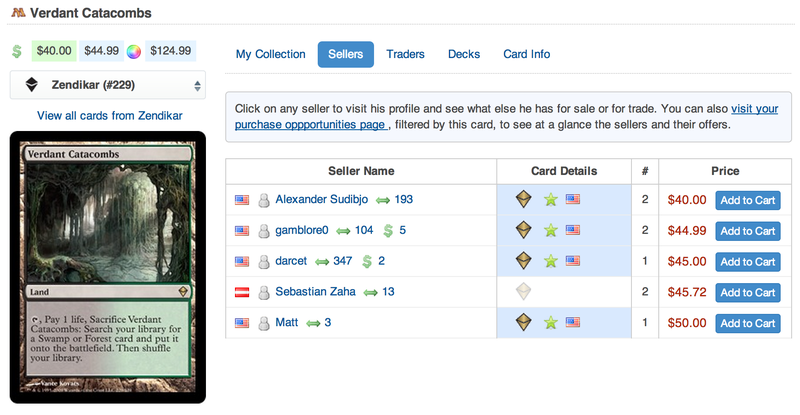 The best site for Magic the Gathering collection management, deckbuilding and trading, with one of the most complete and correct databases of cards. Use powerful tools to find matching traders and buyers based on your collection. 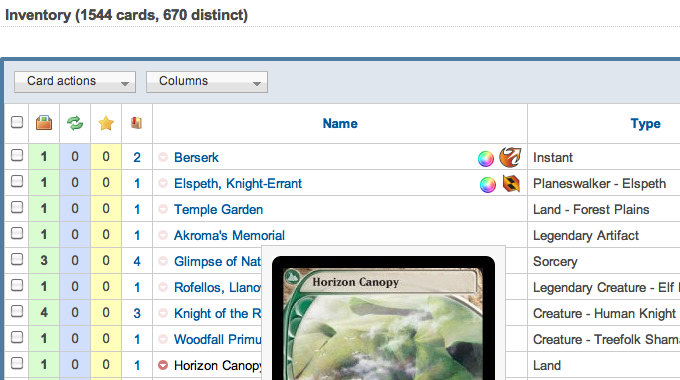 Filter & search your collection, build decks with ease. Browse Magic editions, find deck ideas from other users. With a smart and responsive user interface for adding cards, you can quickly create an Inventory, Tradelist and Wishlist. Showing your friends what you have for trade is just a link away. 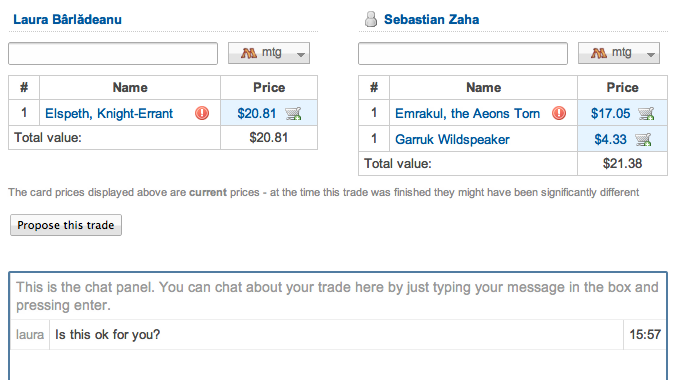 With many people already having collections on deckbox, finding trade partners is a breeze! 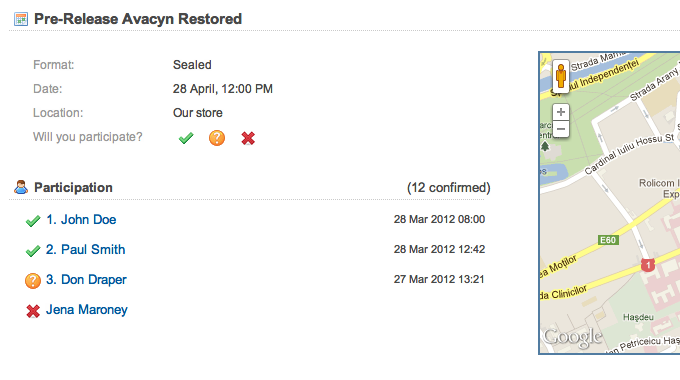 The website will automatically show you cards you can trade with other users. We have a built in interface for defining trades, quick-add inputs, automatic valuing, tracking of sent or received cards, and a strong feedback system to eable easy finding of trustworthy traders. When your collection is managed on Deckbox, what better place to make sales and purchases than here - directly and automatically interacting with your tradelist and wishlist. We calculate relevant market prices for all card printings, and provide mass pricing tools for the seller's convenience. Other Deckbox users already have their wishlists here. We have tools that suggest purchase opportunities and help them find cool deals for the cards they need, thus matching them and connecting them directly to you - the seller. 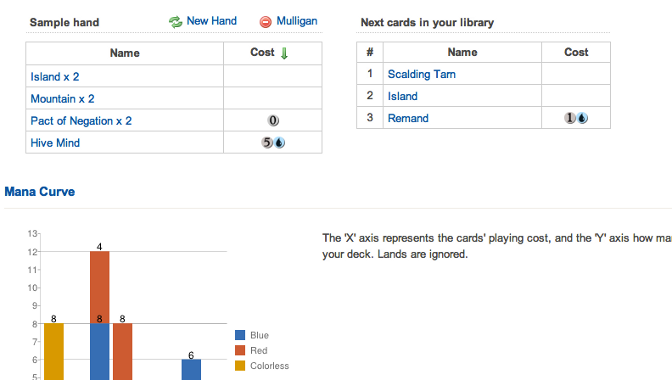 Building decks is as straightforward as collection management. With smart indicators and tools you can see at a glance what cards you are missing for your favorite deck, and then quickly add them to your wishlist. Analyze deck with tools like mana curve graphs, hand draw simulators. Of course trading card games have a strong social component, so you can comment and rate decks, or find out new building ideas from our forums. For community managers we offer the possibility to set up event listings, track event attendance and list winning decks. Smart notifications will show all community memebers when someone joins, comments on a deck or event. Members of communities also easily find trading partners in the community, with specialized trade finder tools. If you are looking for a forum for your community, we provide a subforum as well, free of charge.